Description: This small tree is 25-50' tall at maturity, forming a short stout trunk (1-3' across) and a globoid crown with ascending to widely spreading branches. Outer branches have a tendency to droop at the bottom of the crown. The trunk bark is brown to orange-brown and deeply furrowed with prominent ridges that are straight, slightly curved, or forked. The bark of branches and twigs is orange-brown to gray-brown and more smooth; twigs have a slight tendency to zigzag and they are often thorny. The thorns are ¼-1" long, straight, and stout. Young shoots are green, glabrous, and terete with alternate deciduous leaves. Individual leaves are 2½-5" long and 1½-2½" across; they are lanceolate-ovate with long tapering tips and smooth to slightly undulate along their margins. 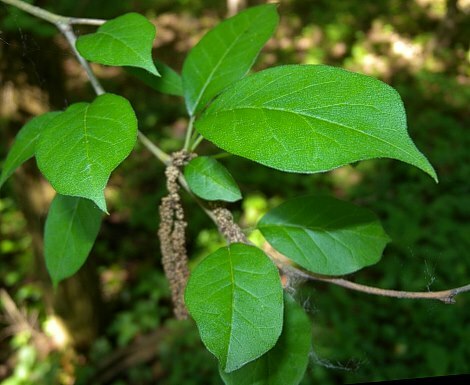 The upper leaf surface is medium to dark green and glabrous, while the lower surface is pale green and pubescent. The slender petioles are 1-2¼" long and either glabrous or short-pubescent. 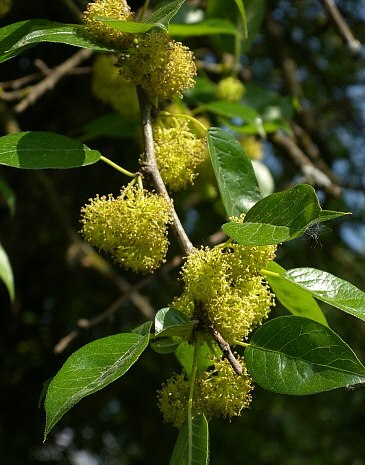 Osage Orange is dioecious, forming male and female flowers on separate trees. Male flowers develop in 1-3 racemes from the axils of the leaves; individual racemes are about 1-2" long and about ¾-1½" across, drooping downward from peduncles about ¾-2" long. Individual male flowers are up to 1/8" (3 mm.) across, consisting of a pubescent green calyx with 4 lobes and 4 stamens with yellow anthers; the male flowers are greenish yellow overall. Female flowers are arranged in green globoid heads about ¾-1" across; these flowerheads are produced individually or in clusters of 2-3 from the axils of the leaves on short pedicels up to ¼" long. Each flowerhead has up to 200 female flowers that are compressed tightly together. Each female flower consists of a thick green calyx with 4 lobes, a sessile ovary, and a single style with 2 long filiform divisions; the calyx and ovary are largely hidden from view. Because of the slender divisions of the styles, the flowerhead has a hairy appearance. The flowers are cross-pollinated by the wind during the late spring or early summer for about 1-2 weeks; this occurs after the leaves have developed. The male flowers soon wither away, while the female flowerheads are transformed into globoid fruits (compound drupes) that become steadily larger in size during the summer. These hard fleshy fruits become 4-6" across during the fall and turn greenish yellow at maturity; they have an aroma that is similar to the fruits of citrus trees. The surface of each fruit is intricately wrinkled and tuberculate. Each fertile fruit contains up to 200 seeds; when cross-pollination doesn't occur, the fruits are seedless. The root system is widely spreading and deep. Cultivation: The preference is full or partial sun and moist to dry-mesic conditions. Practically any kind of soil is tolerated as long as it is not highly acidic. Because of its strong and flexible wood, this tree has high resistance to damage from wind, hail, and ice. It is less tolerant of shade than most trees and there are few problems with insects and disease. Because of the large heavy fruits, female trees should not be located near sidewalks, driveways, or rooftops. Range & Habitat: Osage Orange is relatively common throughout Illinois, except in some NW areas of the state, where it is less common or absent (see Distribution Map). Overall, the abundance of this tree has declined somewhat because of the destruction of fence rows and hedges by farmers in agricultural areas. 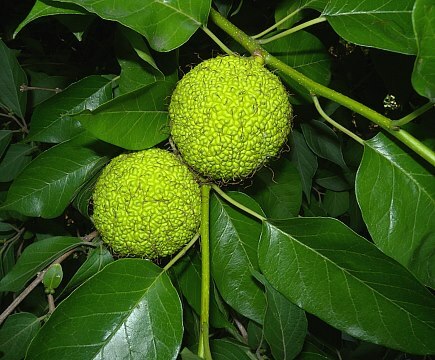 Osage Orange was introduced into Illinois to create windbreaks and to establish thorny hedges that could control the movement of farm animals. It is native to Texas, Oklahoma, and adjacent areas of the southern plains. Habitats include floodplain woodlands, thickets, savannas, fence rows, and overgrazed pastures. This tree is usually found in disturbed areas, and it is occasionally cultivated as a landscape tree. Faunal Associations: The larvae of the following long-horned beetles bore through the wood of Osage Orange: Doraschema alternatum (Small Mulberry Borer), Doraschema wildii (Mulberry Borer), and Megacyllene caryae (Painted Hickory Borer). On the other hand, the wood is considered immune to the depredations of termites. The caterpillars of two moths, Ceratomia hagenii (Osage Orange Sphinx Moth) and Archips argyrospilus (Fruit-Tree Leafroller), feed on the leaves and/or flower buds of this tree. Other insect feeders include Mesolecanium nigrofasciatum (Terrapin Scale), Quadraspidiotus juglansreginae (Walnut Scale), and Quadraspidiotus perniciosus (San Jose Scale). Another invertebrate, Tetranychus canadensis (Four-Spotted Spider Mite), also feeds on this tree. Because the leaves and young twigs contain a bitter white latex, they are not preferred browse of hoofed mammalian herbivores; nonetheless, deer, cattle, and horses will nibble on them to the browse line when little else is available (e.g., in overgrazed pastures). Cattle and horses also consume the fruits occasionally -- like the leaves, they contain a bitter white latex. Fox Squirrels and probably other tree squirrels tear apart the fruits to eat the seeds. 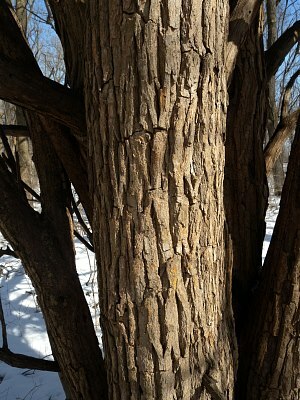 The Brown Thrasher, Loggerhead Shrike, and other bird species use Osage Orange for cover and nesting habitat. The Loggerhead Shrike also uses the thorns of the twigs to impale its prey. On a more speculative note, it is thought that such ice-age megafauna as giant ground sloths, mastodons, mammoths, and/or gomphotheres may have been the primary consumers of the large heavy fruits, spreading the seeds to new areas. After these megafauna became extinct toward the end of the last ice age, this tree lost its ability to spread to new areas. As a result, it remained in the relatively small area of the southern plains, where it was driven by the glaciers of the last ice age. There is some archaeological evidence that Osage Orange occurred as far north as Minnesota prior to the last ice age, and today it thrives in more northern areas with colder climates than Texas and Oklahoma (for further discussion, see Barlow, 2001; Barlow & Martin, 2002). Photographic Location: The photographs were taken at Busey Woods, a lawn, and along a fence row in Urbana, Illinois. Comments: While Osage Orange was not a native tree in Illinois at the time of pioneer settlement, it could be regarded as a native species on the grounds that it was inhibited from spreading northward and eastward by the megafauna extinction at the end of the last ice age (see the discussion in Faunal Associations). Osage Orange is at its best in full sun, but becomes unattractive in shade because the branches of the shaded portion of the tree readily die and lose their leaves. This tree is unique and the only species in its genus. It can be identified by its stout trunk with coarse orange-brown bark, the stout thorns on some of its branches, the structural characteristics of its flowers, and the unique fruits of the female trees. The strong flexible wood has been used to make tool handles, police billy clubs, bows for archery, and fence posts.